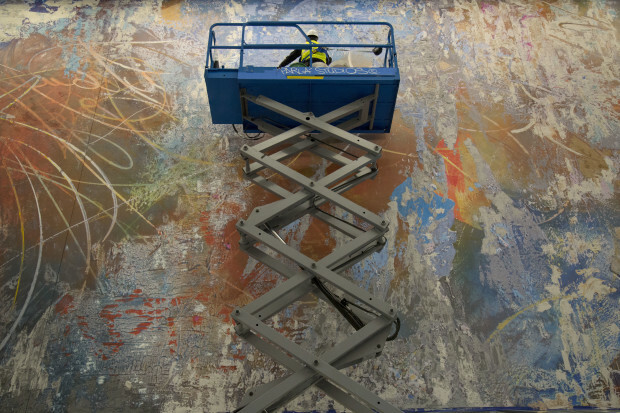 Landmarks commissioned José Parlá to create a site-specific, monumental mural for the atrium of Robert B. Rowling Hall, the new graduate education building for The University of Texas’s McCombs School of Business. 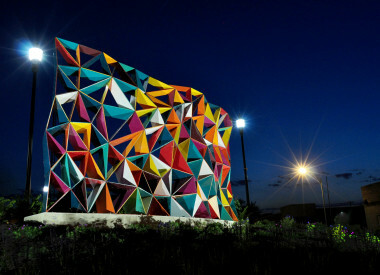 Amistad América is the artist’s most ambitious project to date, transforming a 25 x 160-foot wall at the grand entrance to Zlotnik Family Ballroom into a sweeping 4,000 square foot site-specific visual landscape. 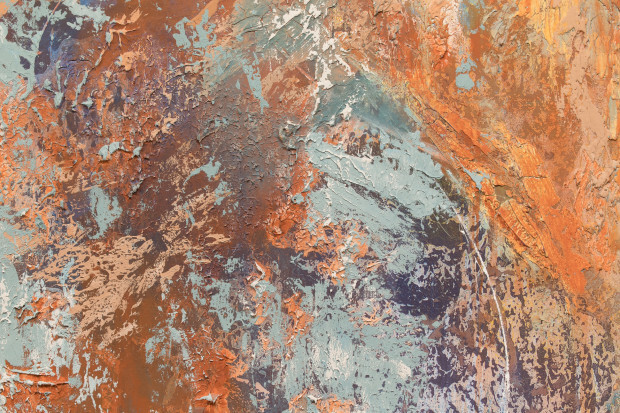 The mural was conceived by Parlá as a narrative that evokes Austin’s natural environment and its urban cityscape, and it features his characteristic traces of collage, pulled impasto surfaces, and signature calligraphic marks. Robert B. Rowling Hall, completed in spring 2018, extends the AT&T Hotel and Conference Center and houses UT’s McCombs School of Business Texas M.B.A. program, among others. 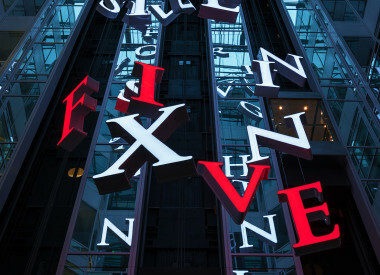 It defines a new identity for the McCombs School and public art for the project was an opportunity to help communicate this visually. Early in the design process, Landmarks and Parlá worked with lead designers at Ennead to identify a suitable location for a monumental mural that would provide inspiration for students and visitors as well as a visual signature for the new building. The wall that was eventually chosen highlights the subterranean entrance to the new building’s conference center and became the featured design element in the massive space. 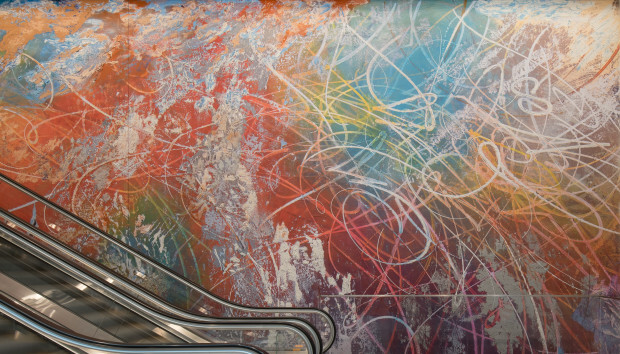 Taking the primary route to enter the ballroom area from the connected AT&T Hotel and Conference Center (and garage), visitors must make their way down a series of escalators and mezzanines passing within feet of the mural the whole way. 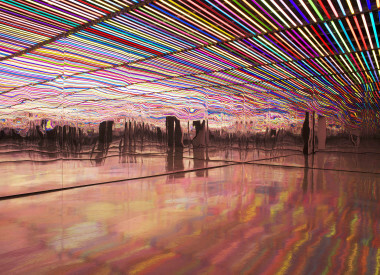 What begins as an intimate, close-up experience of the art then broadens back out to wide angle as one reaches the ground floor where Amistad América can only be viewed in its colorful and massive entirety by looking up. 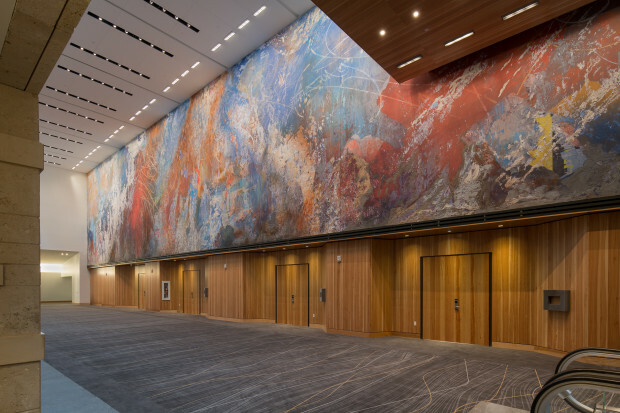 With guidance from UT’s Capital Planning and Construction group, Landmarks and Parlá worked closely with Ennead from the earliest phases of design and conception through completion of the mural. 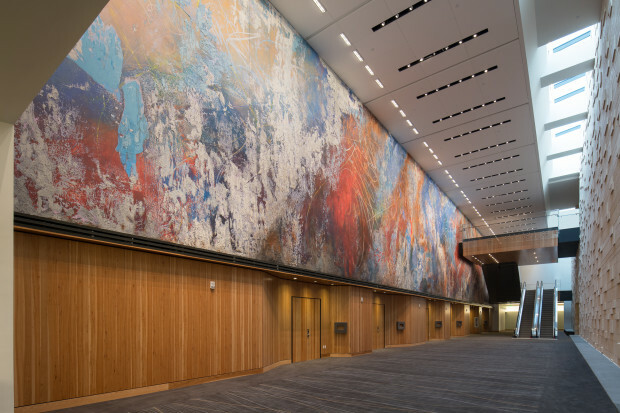 As it took several years for the artist to determine a way to tackle the largest mural he had ever painted, Ennead and team patiently adjusted design of wall support systems and finishes to accommodate. 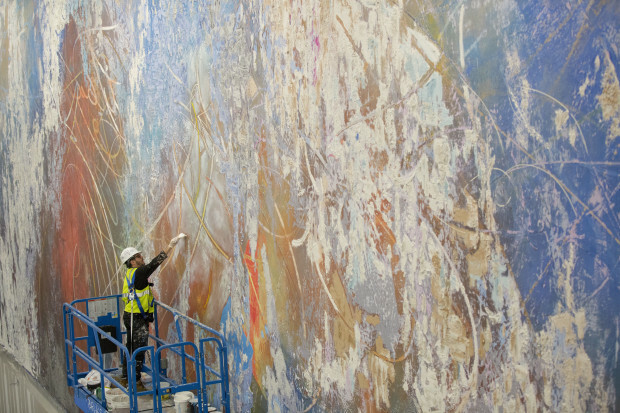 After finding that it would be impossible for Parlá to paint such a large mural by hand in his studio to move onto the site (as is his typical practice), or to paint it on site in a reasonable amount of time between construction completion and building occupancy, a collaborative solution arose. Parlá worked with Duggal Visual Solutions to create an underpainting on canvas which was then hung in the building by Coburn and Company providing a foundation on top of which Parlá applied collage elements, thick pigmented plaster, and calligraphic painting. 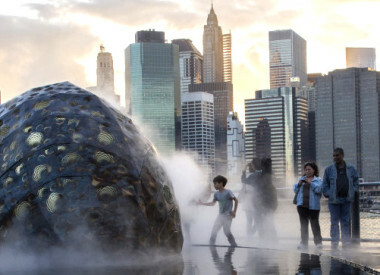 Landmarks consulted with Silver Lining Art Conservation to ensure that all media would work together successfully. DPR Construction and UT’s Project Management and Construction Services provided the artist access to the wall in the midst of construction via scaffold systems and lifts. Amistad América is in the heart of a place that is fundamentally concerned with understanding commerce, a realm that affects our environment, our culture, our ways of being with seismic impact. 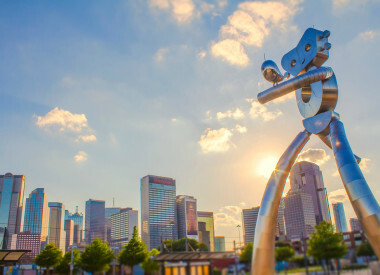 The painting suggests a continental map that connects Austin to a larger ecology with trade and migration routes, while acknowledging its symbolic position at the intersection of Latino and African American culture and history. 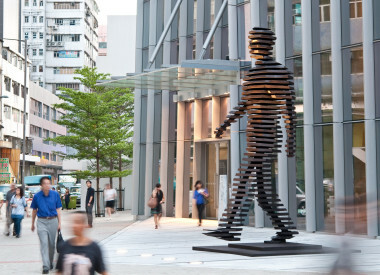 Situated at the business school, it serves as a powerful reminder to tomorrow's business leaders, thinkers, and decision makers that each and every choice shapes the course of our lives, our landscape, and our history.